With every theme update our development team fixes bugs, add new features, improve performance and enhance existing features. So, It is very important to keep your theme updated. In this article you will learn how you can safely update any WordPress Theme to its latest version. You can click on a step to fast forward to it. The first and the most important step of the update process is to backup your entire website just in case if anything goes wrong. For backup, If you not already have a system in place then our recommendation is UpdraftPlus WordPress Backup Plugin. What I like in UpdraftPlus plugin is it provides the ability to back up everything to Dropbox, Onedrive, Google Drive etc. You can read more about it on its official WordPress plugin page. So, go ahead install and activate the UpdraftPlus plugin. You can find a more detailed guide to configure UpdraftPlus by reading this article. In order to make sure you have the most recent version of the theme, follow the steps below. 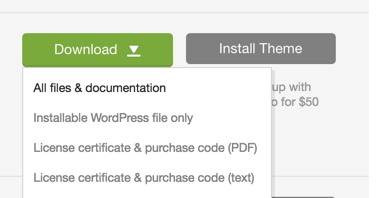 Login to themeforest.net with your account and go to the downloads page. Once you are on the Downloads page, look for your theme and Download button in front of it. Now when you will click on the Download button you will see a drop down with multiple options. In this drop-down list click on All files and documentation (related screenshot below) and you will have the full package of the theme including the premium plugins which come with it. Now you have the full package of the latest version of your theme, extract it and continue with the rest of the update process below. It is not a good idea to leave the website as it is while it is under an update process so you should display a nice message and activate the maintenance mode and in this case, our recommendation is Maintenance Mode Plugin. You can simply install and activate it. Once activated, you can navigate to Dashboard → Settings → Maintenance Mode and customize the maintenance message and Enable the Maintenance Mode. Before updating Real Homes Theme, there are few things to take care first. So, make sure to go through the following points. Disable Caching Plugins: First of all, if you have any caching plugin activated then purge all the caches using the plugin’s options and deactivate this plugin. Update All Out-dated Plugins: Many of us use translation and other plugins, so if you have any translation and other plugins make sure to update them to their latest version. Update WordPress: WordPress must also be updated to its latest version. Secure Important Customizations: One of the most important things to check is if you have made any customizations then they should be in the child theme which is the best practice. So, if you have made any code level changes then copy them to the child theme (if you are not running your website using the child theme then install and activate the child theme and then copy the modified files to it). At this point, I presume that you have followed all of the above steps to be on the safe side before updating the theme. So, simply follow any of the following guides to update the theme. After completing the update process activate all the plugins (caching or other). Once the theme is updated to its latest version, you must check every page of your website to make sure everything is running smooth. This doesn’t require any special steps, just go through each page of your website from the frontend. Hopefully, you won’t experience any problem but if you do you can create a support ticket immediately to get the problem resolved.